ww2dbaseEdward Hale Brooks was born in Concord, New Hampshire, United States to Edward Waite Brooks and Mary Frances Brooks (née Hale). He graduated from Concord High School in the town of his birth in Jun 1911 and the military college Norwich University in Northfield Vermont, United States in 1916. In his final year at Norwich University, he served with the Vermont National Guard at the rank of captain. 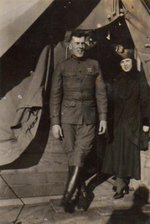 In Aug 1917, he was promoted to the rank of second lieutenant in the Regular Army and was assigned to the Army Service Schools at Fort Leavenworth, Kansas, United States. He married Beatrice Aurora Leavitt in Nov 1917, with whom he would have a daughter and a son. Later in Nov 1917, he was transferred to the 76th Field Artillery at Camp Shelby, Mississippi, United States. In Mar 1918, his unit was moved to Camp Merritt, New Jersey, United States in preparation for departure to Europe in the following month for participating in WW1; for his gallantry in France, he was awarded the Distinguished Service Cross. He returned to the United States in Aug 1919. Until 1921, he served at Camp Pike, Arkansas, United States, where he would become an athlete playing the position of halfback on the All-Army team playing American football. Between Sep 1921 and Jun 1922, he attended the Field Artillery School at Fort Sill, Oklahoma, United States; he would remain at the school as an instructor until Nov 1926. Between Nov 1926 and Oct 1928, he served with the 24th Field Artillery Regiment. Between Oct 1928 and 1932, he served with the 18th Field Artillery Regiment at Fort Riley, Kansas, United States. 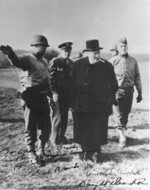 Between 1932 and 1934, he attended the Command and General Staff College at Fort Leavenworth, Kansas. Between 1934 and 1936, he was a military science professor at Harvard University in Cambridge, Massachusetts, United States. Between 1936 and 1937, he attended War College. Between 1937 and 1939, he was an instructor at the Command and General Staff College. 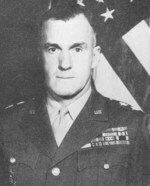 Between 1939 and 1941, he served with General George Marshall at the rank of lieutenant colonel. In Sep 1941, he was promoted to the rank of brigadier general (skipping the rank of colonel) to command the infant armored force at Fort Knox, Kentucky, United States. While he held this role, the United States entered the war in Dec 1941.
ww2dbaseIn 1942, Brooks was promoted to the rank of major general. Early in the war, he played a role in the development of self-propelled guns. As the commanding officer of the 11th Armored Division at Fort Knox, he was in charge with training troops for front line service. In 1944, he was recommended for and received command of the 2nd Armored Division which was slated for the Allied campaign in Normandy, France. He and his staff arrived in France on 8 Jun 1944, two days after the initial landing, followed by the rest of his division on the next day. The 2nd Armored Division saw combat from France into Belgium, during which time Brooks was known for visiting forward command posts personally on a regular basis, which eventually led to the award of a Silver Star medal. In Sep 1944, he was relieved as the commanding officer of the US 2nd Armored Division and was placed in charge on a temporary basis over the US V Corps. In the following month, he took command of the US VI Corps, with which unit he fought in the Lorraine region of northeastern France toward the Rhine River. His corps' advances were stopped by the German Ardennes offensive (also known as the Battle of the Bulge); though the offensive was halted, the unit would not see major action again until the spring of 1945. The VI Corps captured Heidelberg and Heilbronn in Germany and advanced into southern Germany and occupied Austria, with Edwards personally accepting German 19th and 24th Armies' surrender in Austria on 5 May. ww2dbaseBrooks returned to the United States and took charge of the Fourth Service Command in Atlanta, Georgia, United States. In Jun 1946, he was named the deputy commanding officer of the US 7th Army, also based in Atlanta. In Mar 1947, he became the deputy commanding officer of the US 3rd Army. In Sep 1947, he took command of the Antilles Department at Fort Brooke, San Juan, Puerto Rico, followed by a promotion to command all US Army units in the Caribbean area in Nov. In Mar 1949, he was promoted to the rank of lieutenant general and was named the Assistant Chief of Staff for Personnel of the US Army. His final command before his 1953 retirement was the US 2nd Army based at Fort Meade, Maryland, United States. He served on the board of directors of a local bank after his retirement and passed away in Concord, New Hampshire on in Oct 1978 and was buried at the Arlington National Cemetery in Virginia, United States. 25 Apr 1893 Edward Brooks was born in Concord, New Hampshire, United States. 8 Aug 1917 Edward Brooks was made a second lieutenant in the US Regular Army. 7 Nov 1917 Edward Brooks married Beatrice Aurora Leavitt. 8 Jun 1918 Edward Brooks was promoted to the rank of captain. 5 Oct 1918 Edward Brooks was awarded the Distinguished Service Cross for actions at Montfaucon, France. 27 Dec 1918 Edward Brooks' daughter Elizabeth was born. 6 Jun 1920 Edward Brooks' son Edward, Jr. was born. 1 Aug 1935 Edward Brooks was promoted to the rank of major. 8 Aug 1940 Edward Brooks was promoted to the rank of lieutenant colonel. 15 Dec 1941 Edward Brooks was promoted to the rank of brigadier general. 5 Aug 1942 Edward Brooks was promoted to the rank of major general. 17 Mar 1944 Edward Brooks became the commanding officer of the US 2nd Armored Division at Tidworth Barracks near Salisbury, England, United Kingdom. 8 Jun 1944 Edward Brooks arrived in Normandy, France ahead of his US 2nd Armored Division. 2 Sep 1944 Edward Brooks personally led an attack on a 165-vehicle German convoy near Marchiennes, France; this action would earn him the Oak Leaf Cluster to his Silver Star medal. 12 Sep 1944 Edward Brooks was relieved as the commanding officer of the US 2nd Armored Division and was placed in charge on a temporary basis over the US V Corps. 25 Oct 1944 Edward Brooks took command of the US VI Corps. 5 May 1945 Edward Brooks accepted the surrender of the German 19th and 24th Armies in Innsbruck, Austria. 22 Sep 1945 Edward Brooks' son, Major Edward Brooks, Jr., was killed in Belgium in a night flight training landing accident. 18 Mar 1949 Edward Brooks was promoted to the rank of lieutenant general and was named the Assistant Chief of Staff for Personnel of the US Army. 30 Apr 1953 Edward Brooks retired from the US Army. 10 Oct 1978 Edward Brooks passed away in Concord, New Hampshire, United States.